Bob Arrington takes the Minorca 42 for a spin. You used to be able to tell where things were made. From Italian shoes to British cars, regional design influences were clearly visible. But those days are unfortunately over for many products. Global trade and international markets have created a uniformity of design that has all but erased regional uniqueness. Spanish builder Minorca Yachts, however, has found a way to blend the traditional with the contemporary, using historic regional influences to create a boat with modern international appeal. 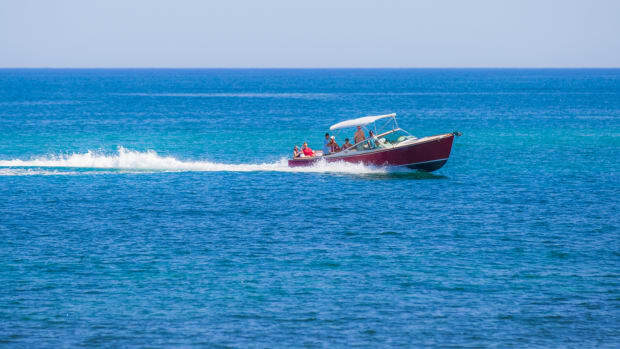 Many popular styles of recreational cruising boats draw inspiration from commercial fishing boat design. 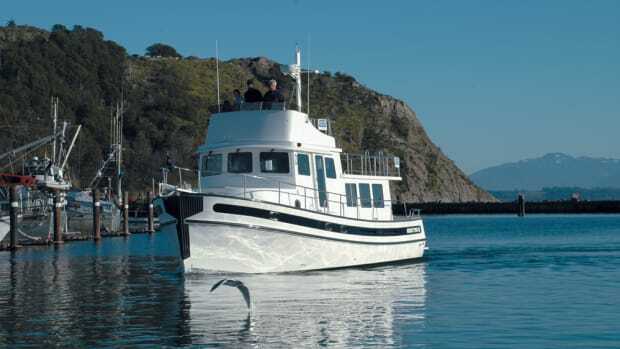 Aspects of West Coast trollers and East Coast shrimpers are clearly visible in modern trawler yachts, and the essence of the Downeast lobster boat shows up in many popular cruisers available today. 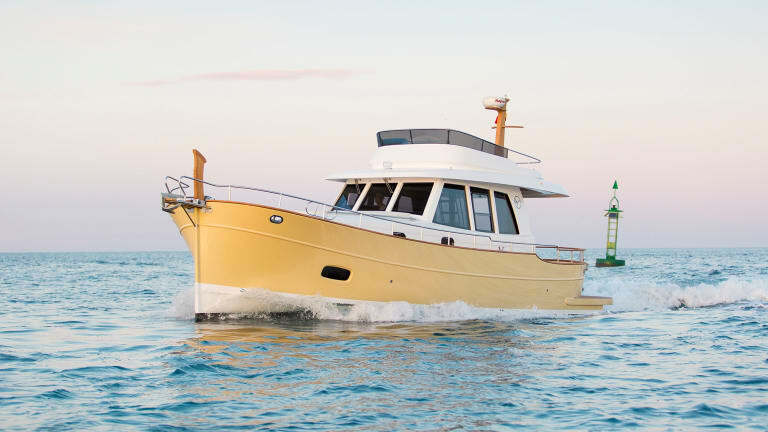 Similarly, Minorca Yachts draws inspiration from the llaüt, a classic Mediterranean fishing boat, retaining its traditional seaworthy hull while incorporating modern advances in materials and design. Making its debut at boat shows this year, the Minorca Islander 42 is a nicely balanced addition to the company’s existing offerings, which range from 34 feet to the newly-under-construction 68. Available with or without a flybridge, the Islander 42 will appeal to many as the perfectly sized cruiser. The size of a ballroom dance floor, the afterdeck is the perfect spot to watch this clean wake and enjoy the sun. Also visible in this photo is the clever nested hatch design that permits access to the engine room two ways. Stepping onto the gracefully rounded stern of a Minorca Yacht, it may feel familiar—there’s a swim platform, afterdeck, saloon, all in an order you would expect. There’s something unique here, though. 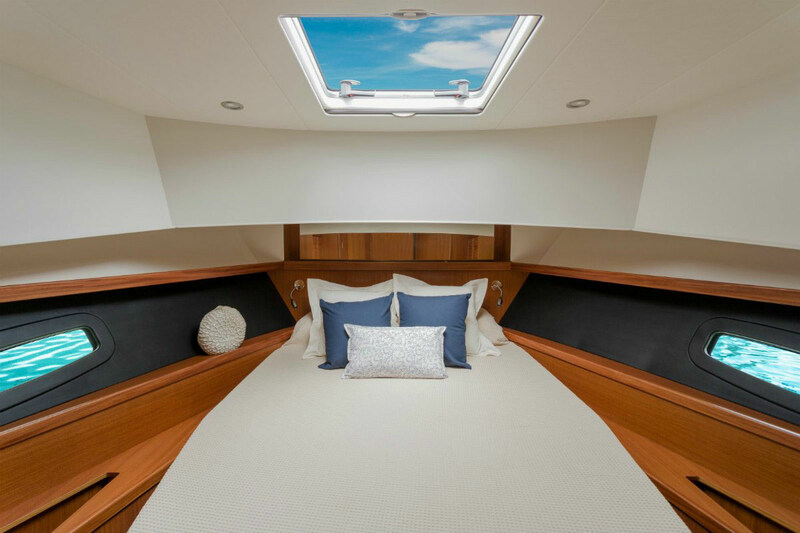 The swim platform, which houses a convenient in-deck storage locker, is large enough for a tender to fit snugly against the transom. And it is also available with a hydraulic lift, making launching and retrieving a tender an effortless and smooth operation. The afterdeck, which is separated from the swim platform by a handsome teak boarding gate, is a welcoming point of entry, a comfortable space to lounge that’s perfect for outside dining. With built-in bench seating and storage space below each bench, the area will likely be the most used space aboard. Surrounding the exterior afterdeck, walkways, and foredeck, is a teak-capped railing placed at a safe yet attractive height. Located within the sole of the afterdeck are two nested hatches. A smaller personnel hatch is contained within a very large equipment/service hatch. Accessing this area for storage or maintenance is as simple as it gets. Once inside the engine room you will find plenty of space for stowage, and all the machinery is organized well. Our test boat was equipped with optional twin 355-horsepower, 6.7-liter Cummins QSB diesel engines. (Twin 320-horsepower Yanmar engines are the factory standard.) The engines face aft and spin the props via a V-drive transmission to make the most efficient use of interior space and to position the props correctly. All serviceable items on the engines are within reach. 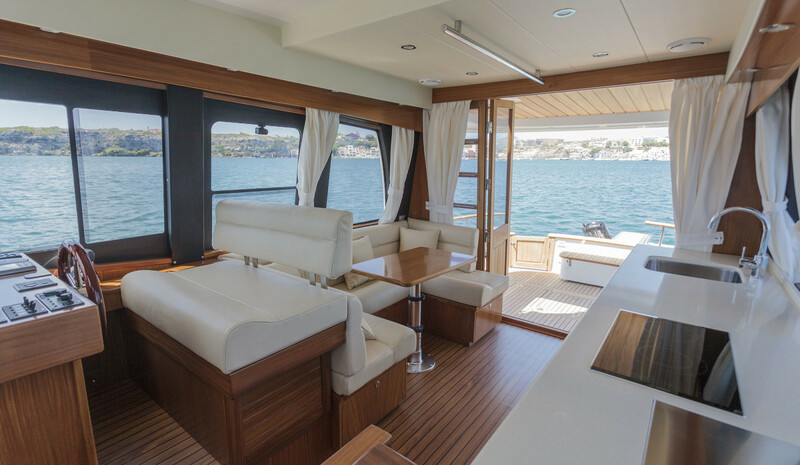 From the afterdeck, entrance to the saloon is through two teak bi-fold doors, which open to the full width of the saloon. Like on the smallest model in the range, the 34, this feature creates a large indoor/outdoor living and entertainment space. Don’t pass through these doors, though, without first noticing the wooden boat hook nicely tucked into a convenient space adjacent to the starboard door. 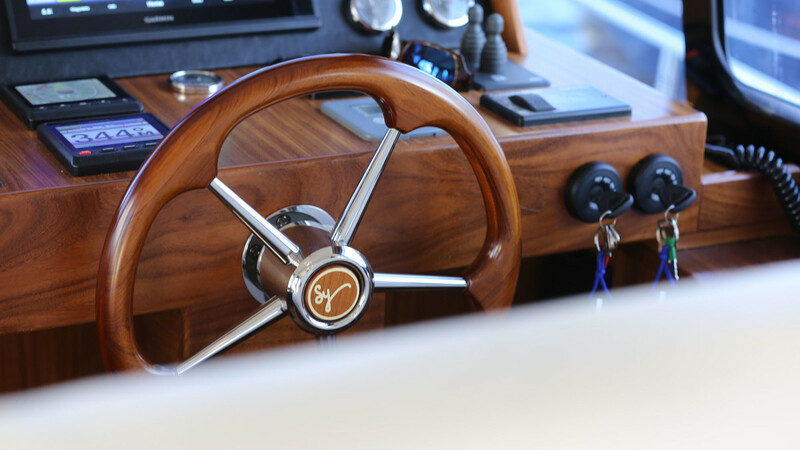 Subtle touches like this exist throughout the boat and prove the vessel’s nautical heritage. Open sightlines, lots of light, and comfortable seating invite crew and guests to relax. The saloon is bright and surprisingly large, thanks to the 13-foot beam being carried almost the entire length of the boat. 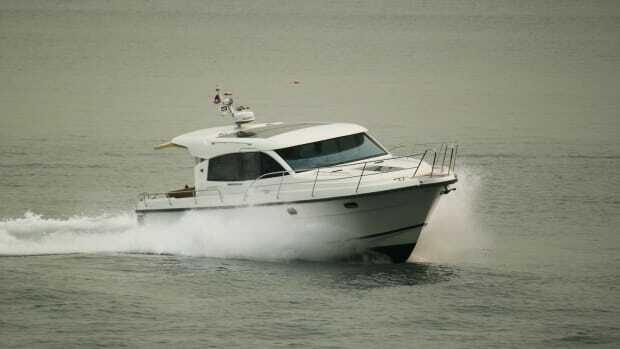 Minorca offers the Islander 42 with several interior configurations, as well. The saloon is available with opposing settees and a pedestal table, which places the galley forward and down four steps (as was the case with our test boat). 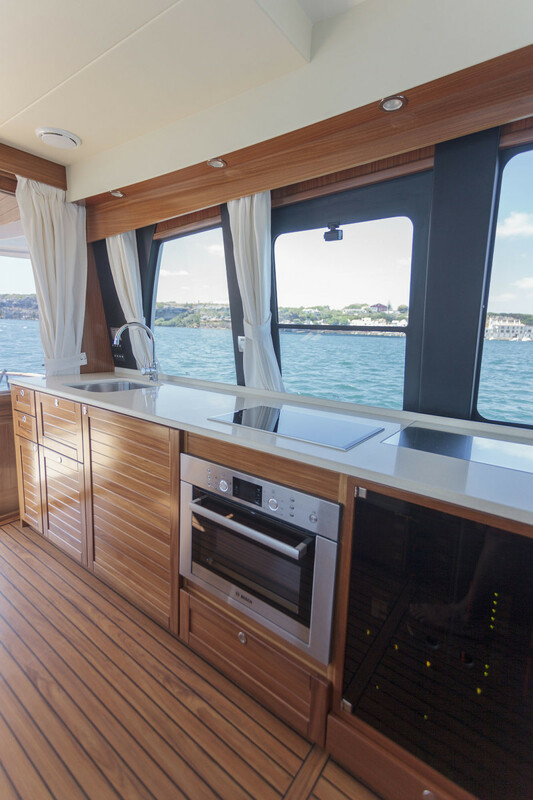 The saloon can also include the galley along the port side for single-level convenience. In both versions, the helm is forward on the starboard side. A comfortable pilot seat faces a well-laid-out helm, containing every feature needed for safe and enjoyable operation. All helm electronics can be installed at the factory. Minorca will work with any of the major electronics companies to suit an owner’s wishes and cruising needs. Visibility from the interior helm is truly 360 degrees with large forward windshields. 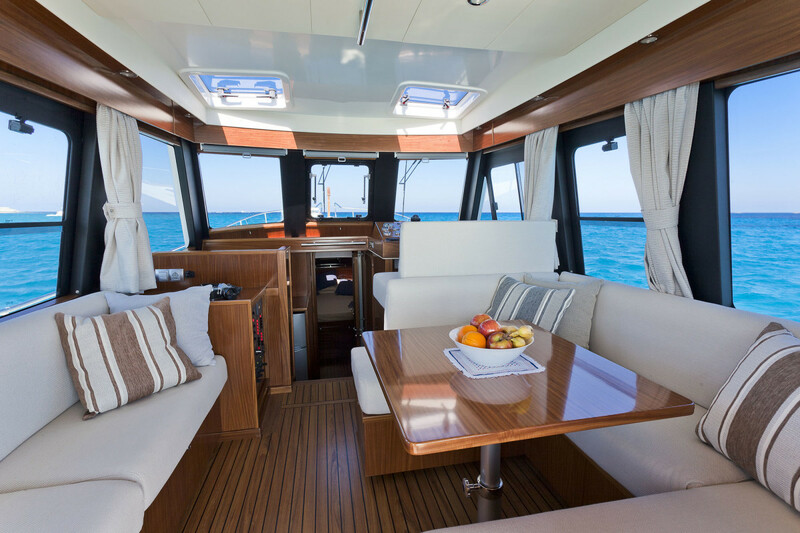 On both the flybridge and standard sedan version, the cabin roof provides shade to the interior with a nicely scaled overhang. The entire Minorca line shows the skilled craftsmanship in places like this sleek wheel. The optional inline galley leaves the chef vulnerable to being tossed about when the seas get snotty. 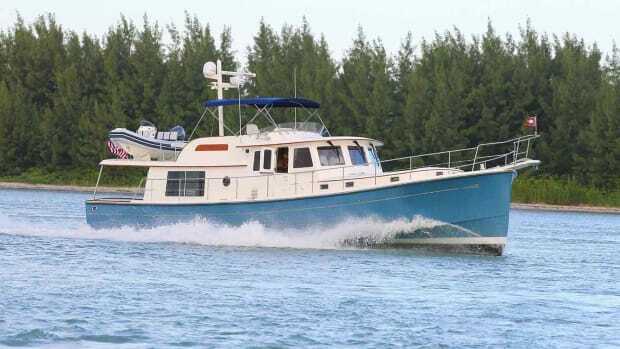 The Islander 42 seems equally adept as a weekend/vacation cruiser, but I could also easily see traveling long distances and spending extended time aboard. The first Islander 42 delivered to the United States, which we had the pleasure to tour, has a galley-down and a flybridge. The galley is thoughtfully arranged with plenty of stowage, including an additional bin tucked into the galley sole. Access to space below the sole is common in many boats, but most only give you access to the glass hull and framing. Minorca took the extra effort to line all of these stowage areas with acrylic bins molded exactly to the space. This provides clean storage while keeping items neatly contained and easy to locate. The galley was outfitted with high-quality appliances and fixtures. An Isotherm cabinet-style refrigerator is located under a three-burner cooktop with overhead space available for a microwave. Minorca, not wasting any space, even used an area under the helm seat for a small freezer. In the galley, they’ve added the convenience of a fan/light combination above the cooktop, an easy-to-use pull-out recycling/waste bin, and a unique drawer within a drawer to help organize dry food items. From the galley, the master stateroom is forward with the guest cabin located to starboard. The master is a generous size and has sufficient hanging lockers and drawers to keep a season’s worth of warm-weather clothes. Under the master berth is access to a bow machinery area, including the bow thruster and its dedicated battery. Having individual batteries for the bow and stern thrusters eliminates the need for long cable runs and the potential for associated voltage drop. All machinery spaces are painted and neatly finished. Roomy island berth fills the forward stateroom. Each cabin has its own head with enclosed shower. There is also exterior access to the guest cabin’s head from the lower deck companionway. Showers use a slotted floor drain, allowing water to flow from both showers to a common sump box. Every usable space on this boat has been opened for stowage and has been finished nicely enough to store anything you could want. A good example is a large area accessed through a bulkhead in the guest cabin. 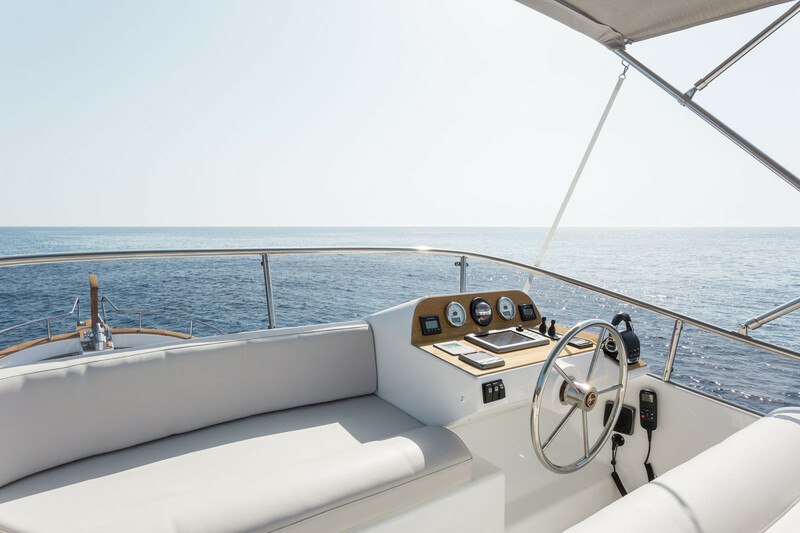 Minorca’s in-house designers have either taken good feedback from boat owners or have cruised enough themselves to have created such thoughtful use of space. Our day for a sea trial came while the boat was en route from the United States Powerboat Show in Annapolis to the Fort Lauderdale International Boat Show. The Islander 42 and her sister Islander 34 were passing Oriental, North Carolina, where I boarded the 42 for a run south to Beaufort, North Carolina. Near Oriental, the mouth of the Neuse River is six miles wide where it joins Pamlico Sound and has the fetch of the entire sound entering it. We pulled out into the river with whitecaps and good-size rollers on our port quarter. Immediately noticeable was the substantial keel and responsive steering on the 42 as it tracked well in this quartering sea. Many semi-displacement hull forms awkwardly go from displacement speed into some form of planing mode, never really feeling like they belong in either. Minorca’s extensive testing and reliance on a proven hull shape has eliminated that. 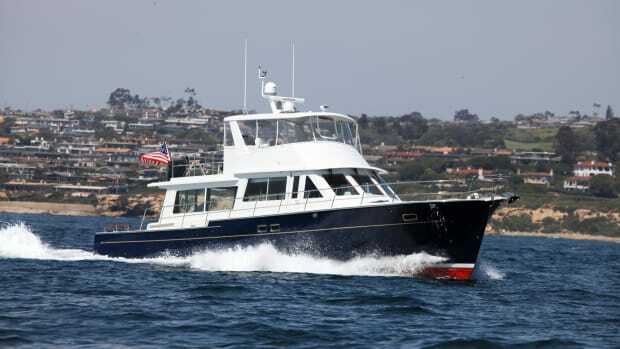 The Islander 42 is solid at seven knots and never loses that feel as the throttles are pushed forward. You never get that “over the hump” sensation of the boat coming onto plane. It just smoothly glides up to faster cruising speeds with a minimal amount of bow rise. This stable ride and ease of handling is partly due to hull design and partly due to Minorca’s use of Zipwake’s dynamic trim control. The system’s motion-control sensors actively manage trim and pitch during acceleration, deceleration, and turns. With minimal disturbance to water flow under the boat, the trim system also improves fuel consumption as compared to conventional trim tabs. The route to Beaufort took us through the calm water of Adam’s Creek, where we were able to experiment with several speed/trim combinations. A fast idle at 1,000 rpm gave us 7 knots, while burning a combined 2.2 gallons per hour as indicated on the Cummins and Garmin helm displays. Bumping the throttles to 1,400 rpm brought us to a very comfortable 8.7 knots with a fuel burn of only 5.2 gallons per hour. Looking for the sweet spot in a fast cruise, we settled in at 2,300 rpm, running 18 knots and burning 18.4 gallons per hour. Top speed was 25.2 knots at 3,040 rpm and a fuel burn of 36.6 gallons per hour. 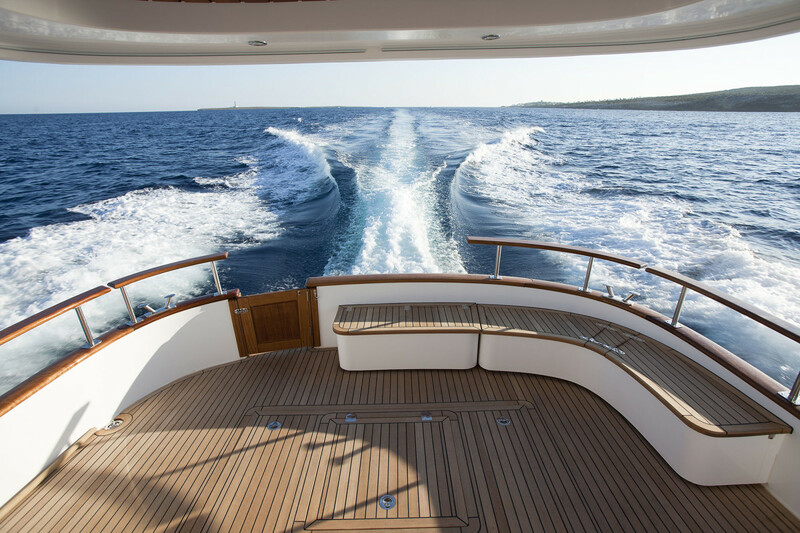 On the flybridge, the helm is straightforward and uncluttered. 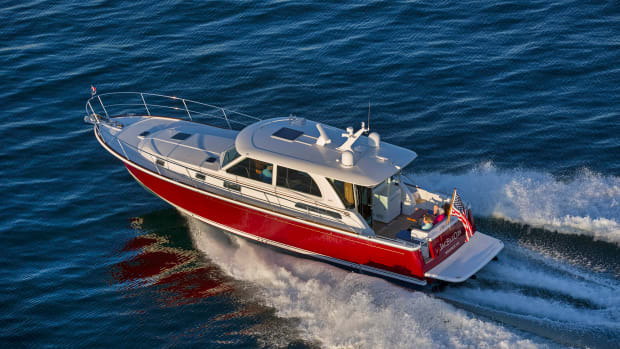 The Islander 42 gives more flexibility in speed, range, and comfort than many boats in its category. 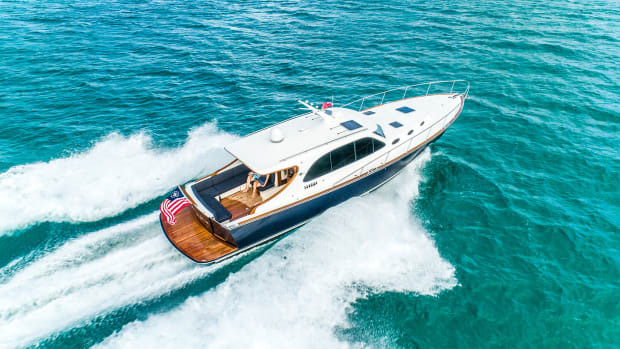 With the flybridge model, you can enjoy a day in the sun surrounded by friends and family, all of whom can be comfortably ensconced in the saloon and lower helm in less clement weather. 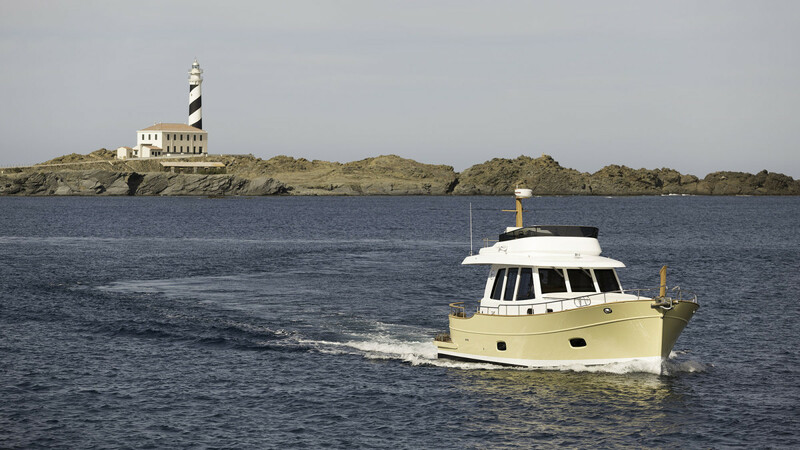 Minorca allows many options to tailor this boat to your type of cruising. 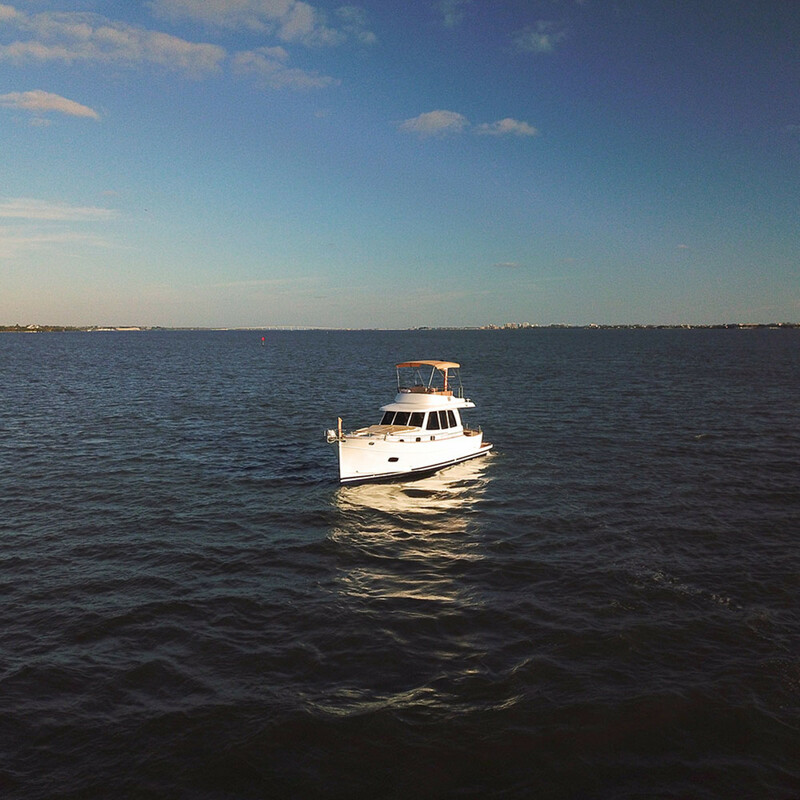 Whether you’re on short cruises or extended travel, the Islander 42, with its open layout, solid build, and CE Class A rating, is ready for any adventure. The llaüt has long embodied the nautical soul of the Mediterranean, with its artful shape and proven seakeeping ability. The original craftsmen who built it were referred to as mestres d’aixa (masters of the adze). 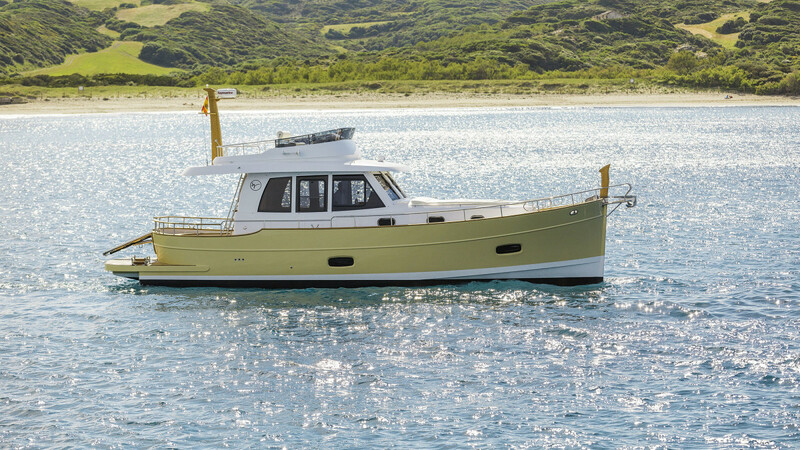 The new Islander 42 from Minorca would no doubt make these masters proud.